If you had suggested even just a few years ago that Star Trek would be the more engaging, stable franchise ahead of the Disney-backed Star Wars, there’d be plenty queuing up to revoke your sci-fi credentials. How times have changed. With Star Wars (and Lucasfilm) scrambling to rejig their movie lineup for the near future, Star Trek is going in another, bolder direction: one where its current TV show, Star Trek Discovery, is making waves with non-fans, and everything they have in the pipeline looks like solid gold just waiting to be mined. It’s clear, then, that Star Wars - often viewed as a quasi-rival to its spacefaring cousin - can learn a lot from Star Trek. 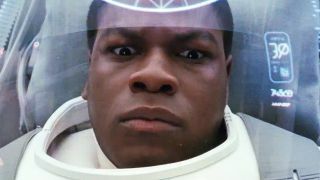 Of course, the two franchises differ in so many ways – one has Simon Pegg speaking in a funny accent and the other… actually, never mind – but it’s clear that Star Wars is now reaching a crossroads similar to the one Star Trek faced in which it must throw off the shackles of what’s shaping up to be a middling movie trilogy. Star Trek has managed to do just that; has even thrived in the circumstances. So, here’s how Star Wars can rocket to the moon, with a little help from Michael Burnham and company. Star Wars’ main issue could just boil down to having too many fingers in too many pies. And don’t they just know it. For now, the Obi-Wan and Boba Fett Star Wars Stories have been shelved in favour of focusing on Star Wars 9. But there’s still the small matter of Rian Johnson’s new trilogy and the Game of Thrones showrunners pulling out what promises to be a multi-movie run. Star Trek, on the other hand, is playing to its strengths: solid, surprising sci-fi on a weekly basis with Discovery that not only thrills as a standalone TV show (not shows), yet plays to the key conceits of the franchise. What Star Wars has given us is a scattergun approach of filling in gaps that (arguably) didn’t need to be filled, while always looking forward to something else that isn’t the movie they’re currently working on. Inevitably, they have become complacent. Star Wars: The Last Jedi, whatever your opinion of that movie, could have benefitted from Lucasfilm’s eyes refusing to wander; they simply took on too much and, honestly, it showed. Discovery, meanwhile, chose to lay its own foundations before looking to extend the property. There were no talks of spinoffs, prequels or all the rest of it – just good old-fashioned Trek, step by careful step. The way it should be. Sci-fi has always been at the forefront of pushing boundaries. So why is it, to an extent, that Star Trek is the only one doing the heavy lifting? Not only does Discovery include a black, female lead, it also features a gay relationship. That’s without diving into its playfulness when it comes to structure, such as Star Trek Discovery episode 7, which throws us a loop (literally). That’s not to say Star Wars hasn’t taken risks. It has. Rey and Finn are both gigantic steps forward for the franchise but, in terms of story, we’re not getting much beyond either a safe retelling of A New Hope in Star Wars: The Force Awakens or re-treading a story that we already know the ending to in both Star Wars Stories. Star Wars: The Last Jedi was the outlier as that, for its sins, tried something different but, as we’re about to see, went to drink at the same well again and again. Star Wars didn’t become successful by re-using the same tropes in a short space of time. The mystique lost by annual Star Wars releases has been displaced by Lucasfilm and Disney not wanting to stray too far from the foundations laid by George Lucas all those years ago. Sure, Discovery keeps things grounded with familiar races and relations to famous characters but at least it’s propelling itself forward by chaining stories to new faces. Star Wars has wheeled out Han, Luke and Leia in recent years and it’s seriously held back the franchise. Finn, Rey, and the rest of the new players are continuously in the shadow of the dominating presence of the Skywalker and Solo clans, so much so that familial reveals surrounding Rey even dominated talk around The Last Jedi. Indeed, most of the umbrage from the let-down fan-base seemingly stemmed from the revelation that she isn’t linked to one of the classic families from the Star Wars universe. Sure, Rey not being Luke’s daughter may have been disappointing for some – but the blame can be placed squarely on Lucasfilm’s shoulders for keeping these characters around long past their sell-by date. We want new; we want daring; we want fresh. I don’t think Star Wars knows how to break free. It may just be destined to repeat the same stories, trapped in a cycle akin to the one of Harry Mudd’s making in Discovery. You may not know who Alex Kurtzman is, but you’ve certainly felt his influence in the Star Trek universe. The unifying factor behind the franchise’s new (and possibly future) TV successes ensures that there is a grand plan; a vision behind every move the franchise makes. That extends to Star Trek’s new series, miniseries and animation currently in the works. Kurtzman will oversee all of it. Then there’s Star Wars. You only have to look at the lineage of directors (J.J. Abrams, Rian Johnson, Abrams again) to see that there’s going to be a lot of picking up the pieces going on by the time Star Wars 9 rolls around. While he wasn’t the first choice for the trilogy-ender, Abrams is still going to have to recover a story that has veered wildly from his original intentions – Daisy Ridley has revealed as much – and it just makes the whole process appear fractured. Installing one person – not Kathleen Kennedy, who has a whole board of directors to answer to – to be in charge of the key story beats and the direction of the franchise would mean events such as the backlash to a disorientating The Last Jedi would feel less pronounced, because there would be an obvious sense of meaning and reasoning heading into (and out of) each movie before the next chapter. Instead, we have people coming and going, leaving their own temporary mark on Star Wars that quickly fades. Whisper it, but Star Wars might need a George Lucas-type figure again, for better or worse. It may seem like sacrilege, but a live-action TV show could be the best thing for Star Wars at this point. Go and explore the galaxy; give us new events in a new time left untouched by the Skywalker clan. There’s so much to play with in this universe and yet, incredibly, we’re left with the same half-dozen or so figures who have known each other for decades continually crossing paths – and their relatives and descendants doing the same. The First Order is an echo of the Empire, Kylo Ren a shadow of Darth Vader, and on and on the cycle continues. A TV show can help break from that. There’s so much you could do. Want a crime-procedural set in the backwater of a seedy planet? Sure, go nuts. A coming-of-age story on the streets of Alderaan, everything given a tragic tinge because we know their ultimate fate? Why not? It’s not all lightsabers and grand, universe-ending Death Stars, you know. This is what Discovery has done so incredibly well. Fresh off the failings of a trilogy of movies that failed to spark a Trek renaissance, the show just said screw it, and introduced an ensemble cast in an untouched time period and went on to do its own thing. And that’s just season 1. Who knows what it could go on to accomplish? That’s all because it blazed a trail for itself that, while still remaining reverent to the shows that came before it, marched to the beat of its own drum. It could’ve kowtowed to fans’ demands for a safer spinoff, but chose not to. And it’s all the better for it. Star Wars, of course, has its own problems with fans. Ignore them. Star Wars has never been about bowing to the expectations of others and, post-Star Wars 9, it’s about to reach an impasse: become new and engaging again, or be destined to be stuck behind Star Trek, perpetually playing to a crowd that’s growing steadily tired of what’s on offer.